As the patent on Gleevec (Imatinib Mesylate manufactured by Novartis) expires throughout Canada and the world, more and more versions of generic Imatinib are being put on the market. When generic Imatinib first became available in Ontario, there were mixed reviews. We heard from patients who, after being switched from the brand Gleevec to a generic form, were experiencing new side effects like vomiting and arthritis-like pain. There were many others who experienced no change at all. More concerning though, were those who saw a change in their response. So if the generic is the “same” as the brand, why are some patients experiencing new side effects, and changes in their response? While the generic versions (manufactured by Apotex, Teva and now Cobalt) of Imatinib Mesylate have been deemed bioequivalent by Health Canada – meaning that it should work the same in the body as the brand Gleevec – each version uses different “excipients.” An excipient is a bulking agent added to the drug to help the manufacturing process or absorption and solubility. The addition of these excipients mean that the generics are different than the branded formulation, and could potentially affect how a patient responds. 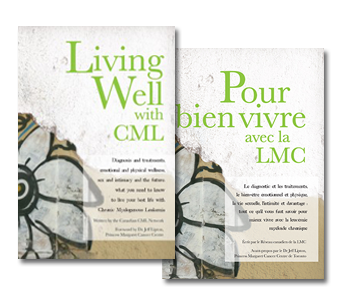 Montreal-based CML-IQ, an information service focused on everything CML, recently published findings from a Quebec study on the efficacy of generic Imatinib. The results were a bit disturbing, showing that people who switched to generic Imatinib from Gleevec were more likely to show a loss of response after being on the generic for 1 to 2 years. The study also showed that while a similar number of patients achieved a response in the first 3-6 months of taking either the generic or Gleevec, the likelihood of an early molecular response was lower with the generic. Read more about this study here. While there is clearly more work to be done to fully determine whether or not the generic versions of Imatinib are as effective as Gleevec, there are a few steps that patients who have been switched can take to manage their health. Be on the lookout. While your pharmacist should tell you if your drug has been switched to the generic, they may not, so be aware of things that may indicate you have received the generic, such as different packaging. If you do receive a generic version of Imatinib, be sure to tell your doctor so that they can be aware should you experience new side effects or a loss of response. Keep it the same. Be aware of which generic version you receive – does it come from Apotex, Teva or Cobalt? Make sure you receive the same generic every time you refill your prescription. Monitor how you feel. Keep notes on any new side effects you experience, or if you are feeling differently after starting a generic. Also, keep an eye on your PCR result to ensure that if you experience a change in your response, it is caught as early as possible. I am one of those in the study re. gleevec verses the generic and had received help from the manufactures of the original. Unfortunately my health insurance coverage has reached its max and though I don’t want to return to a generic ( many bad side effects) I cannot really afford the costs of the original. Any thoughts? My apologies for not replying sooner!!! Your note got lost in a mountain of spam!! Where are you located?